The lead designer of manned spacecraft at RSC Energia talks about the new interplanetary spaceship in development. 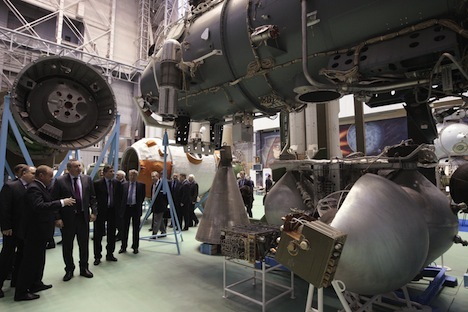 On Feb. 1, the science and engineering board of the Russian Federal Space Agency will review the design of a manned spacecraft that will replace the current Soyuz spaceship in seven or eight years. The new generation ship has a rather checkered history: finalized preliminary designs for the project had to be revised when its original designation as a transport ship to deliver freights to low Earth orbit was upgraded, and it became an interplanetary vehicle capable of taking humans to the moon. The lead designer of manned spacecraft at RSC Energia, Nikolai Bryukhanov, speaks to Izvestia about how they managed the project. Izvestia: What changes had to be introduced to the project when the decision was made last year to prepare for a manned lunar mission? Nikolai Bryukhanov: Changes were introduced to the design specification in April 2012. It seemed minor at first, but it necessitated major modifications in the work that we had been doing on the ship since 2010. First of all, the velocity of atmospheric entry was changed. In the previous configuration for the orbital vehicle, we had all our calculations based on the velocity of 8 kilometers [4.9 miles] per second, and now we have to change it to 11 kilometers per second. This is a huge difference: the new vehicle must have at least twice the kinetic energy as one that returns from low Earth orbit. This energy is converted into heat, so the thermal protection cover must be totally different. The problem is that, since the Buran project was shut down more than 20 years ago, we have had no research in heat protection; we have made no progress whatsoever. We had to conduct research of our own on a very tight schedule, to complete the work that others took decades to carry out. We managed to do it, and air tunnel and plasmatron trials were successful. Ballistics was another challenge — easily the most complicated task when you’re talking about flying to the moon. Our country is far from the equator, and our position is quite poor as far as payload deployment is concerned. In order for a re-entry vehicle to get back to a Russian landing range, we need to deal with increased energy consumption and fit into the narrow “windows” to launch the vehicle from lunar orbit. Izvestia: Where will the landing ranges be located in Russia? N.B. : We are planning to have them in the southern regions. The vehicle will return to Earth via the South Pole, so the farther north the landing site, the more challenging the task. However, we also need to think about emergencies — for instance, if the crew has health problems and we have to return the ship to Earth. We must be able to do this at any time, but if the “windows” are so narrow, there is a safety issue. The propulsion system should, therefore, be able to produce an impulse that is strong enough to bring the ship back to Earth. However, low Earth orbit ships require an impulse of hundreds of meters per second, whereas a lunar ship needs a much more powerful thrust. It was hard, but we offered a flight procedure that allows the ship to get back to Earth in case of emergency. The propulsion bay got a big bigger, because we need about 8 tons of fuel in there. Otherwise, the original concept remained: a re-entry space shuttle landing on shock-absorbing blocks (that is, without the “tumbling” that is typical of Soyuz). Izvestia: Were the priority research sites on the moon factored in your calculations? N.B. : We took on a major challenge to land on the polar orbit of the moon. If we manage to land there, then we’ll be able to land virtually anywhere on the moon in the future. Furthermore, it is the polar regions that attract researchers the most. That’s why we chose a universal trajectory to address multiple tasks. Izvestia: Have changes been introduced to the equipment design of the ship? N.B. : Some things had to be changed. We need to upgrade the radio systems, because the distance is greater. The life support system must be built on different principles, because it is one thing when astronauts travel to an orbital base (and it takes them two days, at the most) and a totally different thing when they travel to the moon. We must have a more reliable system, because we can return a cosmonaut from the [International Space Station] any time, but it takes at least three-and-a-half days to fly from the moon. We also had to revise the thermal control, electrical power and some other systems. Overall, the entire project had to be revisited — we had to redo the work that we did in 2011 and early 2012. Izvestia: Theoretically, when do you think the new ship will be ready for test flights? N.B. : It’s hard to say. The adopted schedule includes specific project stages, and the most expensive stage starts now. As soon as we complete design documentation, we will have to build test units, including experimental ships to test drop-offs from planes, launches, emergency rescue systems, etc. We are working on the assumption that we have to be ready with the unmanned version by 2018.